Like its older sibling ramen, hiyashi chuka’s origins are a bit fuzzy, but it’s become a ubiquitous dish served at ramen restaurants all over Japan during the summer. Enjoy this recipe from Marc Matsumoto of No Recipes. See the full post at the Fresh Tastes Blog. Put the cucumber, 2 teaspoons of rice vinegar and 1/4 teaspoon of salt in a bowl and let it sit. Whisk the egg with a pinch of salt until the yolk and white are well incorporated. Heat a non-stick frying pan over medium heat until hot. Wet a paper towel with vegetable oil and spread a thin layer of oil onto the pan. Pour just enough egg into the pan to form a thin crepe. Once set, use a spatula to flip and cook the other side until just set. Transfer to a cutting board and repeat until you’ve used all the egg. Stack the egg “crepes” and roll them together. Use a sharp knife to slice the egg as thinly as possible. Boil the udon noodles according to the package directions. When the noodles are done, drain in a colander and run cold water over them until they are at room temperature. Add the noodles to a bowl of ice water to chill the noodles, and then drain well in a colander. Add the water, soy sauce, sugar, rice vinegar, sesame oil, salt, and chili sesame oil into a bowl and whisk together. 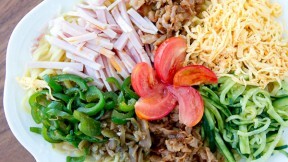 Split the noodles between two bowls and top with the pickled cucumber, ham, egg, and tomatoes. Pour the sauce over the noodles to taste.